Padar Island some says, is the renown Neverland. I heard from various travel fellow that were just come back from the trip, that the island is one of the last pure gem on the earth. When my chance came to visit the said Neverland, I was left stunted. Every corner of the island is mesmerizing, with undulating topography and three coloured beaches peeking from every hiking intersection. Speaking of the beach, what can be more awesome than having three coloured beach—with one of them being the rarest on earth—in one single, tiny island? The Padar Island tour generally comes as part of the itinerary to Komodo Island. Yet, Padar has proved that it’s not a mere sidekick. A lot of adventure happened there and surely it will leave long-lasting memory to your travel journey. A lot of travel destination recommends the best time to travel to the place, but I dare say Padar is worth to travel anytime. Except when the rain was the heaviest. Just after the monsoon season is over, the land is the greenest. When you are hiking to the famous Padar hilltop, it’s very rewarding to see the tumultuous green hills, rising up and down, in contrast with crazily blue water and clear sky. Even ‘beautiful’ is not enough to describe the highly vibrant, technicolor landscape. When the dry season comes, the island doesn’t lose its beauty. The green grass is turning yellow to auburn, and the bare jagged hills, looming from afar, radiates strong vibe of prehistoric era. The dry land is now dotted with green trees. Brownish land unexpectedly stands harmoniously with the sugary beaches and the surrounding turquoise sea. It’s almost like being transported in savannah of the lost world. Undoubtedly, hiking in the hilltop is the main and most popular thing to do in Padar Island. The hike, which generally take an hour to reach the top, is fairly short and easy. All you need is a pair of good shoes and you are good to go. Well, you might see some travelers hiking with only flip-flop or even barefoot, looking laid-back and adventurous, but that’s definitely not something you should follow. I have heard form other travelers that they got their feet a burned from the hot land and sometimes got a little hurt from the rocky sands. Once you get to the top, you will forget about everything else in the world. You will be greeted by three differently coloured beaches, beautifully curved on both side of the island, squeezing jagged ridge in the middle, only to meet with endless sea and sky. This place is definitely a dream of every travel photographer. I have no doubt why the island is rising in popularity among us travelers. After the hike, the rest of it is taking gorgeous photos at almost every corner and marvel through the tiny island. Down the hill, you can rest at the black, white, or the famous pink beach. I really enjoy my time there—and who can’t? Some girls were enjoying sunbathing with pink sands below their bikinis, and some other took their time to snorkel under the water. For me, cooling down in the shore while watching the clear turquoise water lapping against the soft pinkish sands was just as rewarding. The remoteness of the island make it quite empty from horde of tourist—you might only encounter a few tourists along the hike, but sometimes you can be lucky to be the only one (or the only group) to wander around the island. I gotta say, this is the epitome of being deserted in style. If not due to the inexistent accommodation on the island, I will want to stay all day long in Padar Island. But alas, to the liveaboard I must go back, but that’s not necessarily a bad thing. Luckily I have a good ship during my trip, which allows me to sleep soundly and keep sea sickness at bay all time long. 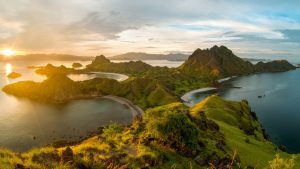 Have you put Padar Island to your travel bucket list? Let me know!